Manufacturer of a wide range of products which include 2mm pp ropes, triplex pp ropes, twist pp ropes and agriculture pp ropes. We have a complete devout in offering highly demanded Triplex PP Ropes. Our offered rope is becoming the first choice of fisheries and industrial applications because we adhere to the set industry standards and have developed the premium grade rope which does not loose BS in wet conditions. The UV stabilized ropes are made at our next generation manufacturing setup and can be ordered from us in 3 strands and 4 strands pattern at a market leading price. 3-Strand "Z" Twist Polypropylene Rope (UV Stabilised), The sizes range available is 2mm to 42mm Diameters, which can be made in 3 Strand or in 4 Strand. These ropes being lighter by nature finds a lot of demand in international market and are highly recommended for various applications. 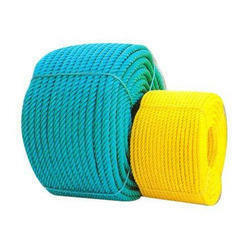 Owing to our technological adeptness, we are at the forefront of offering best quality Twist PP Ropes. We are specialists of fabricating twisted polypropylene ropes that are gaining huge acclamation in the industry for its unmatched breaking strength in both wet and dry conditions. 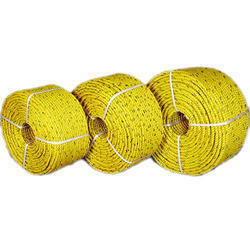 The offered rope is exclusively made for fisheries applications where uniform lay is highly required. Further, we are utilizing the advanced manufacturing methodologies to present the premium grade rope which can be availed from us in 3 o r 4 strands design. Our immense domain expertise and market knowledge assist us offer the finest quality array of Agriculture PP Ropes. The offered PP ropes are manufactured using high density polyethylene and advanced techniques under the supervision of deft professionals at our vendors' ends. These PP ropes are widely used in industries, domestic purposes and other various areas. Apart from this, clients can avail these PP ropes from us in different sizes at market leading prices.